It won four Oscars, one of which was for best picture, but to both my wife and I, No Country for Old Men was turned out to be quite a disappointment. The reason was not because of the acting, because each character was brought to life vividly by the talent hired for the film (Javier Bardem as Chigurh, Josh Brolin as Llewelyn Moss, and Tommy Lee Jones as Sheriff Bell). It wasn't due to a poorly written story, as that had us engaged and eager to witness what the next scene would bring. The notable lack of music had no part to play in our disappointment, as it helped complement the cinematography in providing the perfect sense of atmosphere. In fact, you might actually say the movie was really pretty good... until it reaches the last part of the third act. Yep, the ending is from where all of our disappointment exudes. Within say about the last 10 to 15 minutes of this 2 hour film, everything started to fall apart. It felt almost as if the filmmakers had gotten tired of making the movie and just decided to throw a few scenes together and call it the end. We miss out on what we were expecting to be an awesome fight to the finish battle of wits between two extremely clever opponents, but all we're treated to is the aftermath, and because of the angle at which this aftermath was shot, we weren't even able to recognize that what we were looking at was the aftermath. And then we're treated to two strange scenes of Sheriff Bell just talking to people whom we've never before met about topics that don't seem to relate at all to the rest of the plot. It may not seem very significant after enjoying so much of a well-made movie, but let me try to put this in perspective... it would be like watching the original Star Wars, seeing Luke Skywalker and the other rebel getting in their X-Wing fighters all psyched up and prepared for the final assault on the Death Star, and then the very next scene seeing some kind of general explosion, followed by a scene of Wedge Antilles talking to his old buddy from Tatooine that we never met, then having him going home to his wife and telling her about a dream he had. Do you think Star Wars would have become such a classic if it had that kind of ending? I'm just glad my wife watched it with me, otherwise I would have just figured that I was going insane. At any rate, the basic plot of the movie is about a man named Llewelyn Moss who hunts for food in the plains of Texas, and one day while hunting he comes across a drug deal gone bad. In addition to finding a bunch of dead Mexicans riddled with bullet holes, he also discovers one who is severely injured but still alive, and a case filled to the brim with cold, hard cash. So he takes the cash, and leaves the dying dude. He is a drug dealer after all. But this is not where his problems begin. His problems begin that night when he returns to the scene in order to give the only surviving dude some aqua. He arrives to find that someone else has been there after him, and that someone else just arrived right now! And so the action begins, with interesting and intelligent characters pitted against each other until it all just putters out in the end. This DVD release contains a few bonus features, Working With The Coens , The Making of Not Country For Old Men , and Diary Of A Country Sheriff . I would have liked some deleted scenes or some commentary or something to explain the ending. But unfortunately, there's nothing like that. But it did win best picture so I guess some people had no problems with it. And this is a bit confusing to me, as I though good endings were supposed to make or break a movie. I mean, look at The Sixth Sense . Everybody loved that movie, but the film itself really wasn't anything special, it just happened to have a really cool ending. But whatever, there's my opinion, take it or leave it. A pair of award-winning filmmakers and an acclaimed cast propel a riveting crime saga to its unforgettable conclusion in one of the most honored films of the year, No Country for Old Men, coming to DVD and Blu-ray Disc on March 11, 2008 from Miramax Films. Joel and Ethan Cohen deliver their most gripping and ambitious film yet in this sizzling and supercharged action-thriller. This gritty game of cat and mouse will take you to the edge of your seat and beyond. A collection of behind-the-scenes bonus features including a look at the Coen Brothers filmmaking process makes the No Country for Old Men DVD and Blu-ray Disc an experience you don’t want to miss. 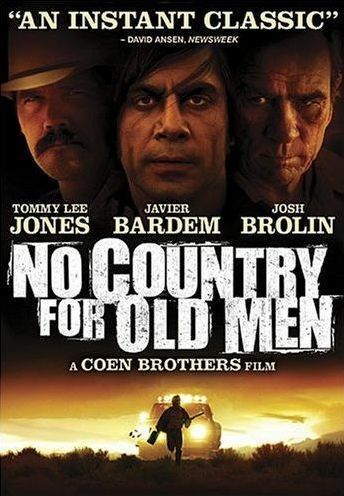 Delivering their most viscerally compelling and ambitious film yet, Joel and Ethan Coen wrote, directed and produced No Country for Old Men based on the novel by Pulitzer Prize-winning author Cormac McCarthy (2007 Fiction for The Road). The film features virtuoso acting turns by Tommy Lee Jones, Woody Harrelson, Javier Bardem, Golden Globe nominee Kelly MacDonald (2005 Outstanding Supporting Actress in a Miniseries or Movie nominee for “The Girl in the Café”) and Josh Brolin (Grindhouse). No Country for Old Men has been nominated for 8 Academy Awards® including Best Picture (Drama), Best Director (Joel Coen & Ethan Coen), Best Adapted Screenplay (Joel Coen & Ethan Coen) and Best Supporting Actor (Javier Bardem), Best Cinematography, Best Sound Mixing, Best Sound Editing and Best Film Editing. The film won two Golden Globes, including Best Screenplay – Motion Picture and Best Performance by an Actor in a supporting Role, as well as Best Picture of the Year, Best Ensemble Cast and Best Adapted Screenplay from the National Board of Review and Best Picture, Best Director, Best Screenplay and Best Supporting Actor from the New York Film Critics Circle. It also was named Best Picture of the Year by the Washington D.C. Film Critics, Boston Film Critics, Chicago Film Critics, Dallas-Fort Worth Film Critics Association and Southeast Film Critics Association. Critically lauded for its powerhouse performances, pulse-pounding suspense, and achingly beautiful cinematography, No Country for Old Men has appeared on countless “Best Movie” lists for 2007. Roger Ebert of the Chicago Sun-Times declares it "Flawless." Peter Travers of Rolling Stone calls the taut crime thriller "The Coens at the peak of their powers," while David Ansen of Newsweek raves "Riveting...an instant classic!" Violence and mayhem erupt in the parched scrubland and panoramic skies of West Texas after Llewelyn Moss (Josh Brolin) stumbles on a suitcase containing $2 million dollars at the site of drug deal gone bad. Fleeing with the money, he is stalked relentlessly by hired gun Anton Chigurh (Javier Bardem), an unstoppable sociopathic killer unafraid to leave a bloody trail in the wake of his cold-blooded search to recover the cash. As Moss scrambles to hang on to the money and his life, small-town sheriff Ed Tom Bell (Tommy Lee Jones) closes in on both men in a tautly plotted cat-and-mouse game that will keep viewers on the edge of their seats until the final credits roll. Both the DVD and Blu-ray Disc include bonus features that take viewers behind the scenes of one of the most compelling thrillers of the year and shed new light on the complex characters and celebrated creators of No Country for Old Men. Learn more about Joel and Ethan Coen from the perspective of their collaborators, cast and crew. Take a journey through the Coen Brothers’ process and back to their roots as storytellers with a unique voice and vision. Explore the relationship between the compassion of Sheriff Bell and the brutality of Anton Chigurh. No Country for Old Men on DVD has a suggested retail price of $29.99 in the U.S. The Blu-ray Disc is priced at $34.99 in the U.S. I've forgotten where this content and image came from. Sorry! Edited by yours truly (contact me)).